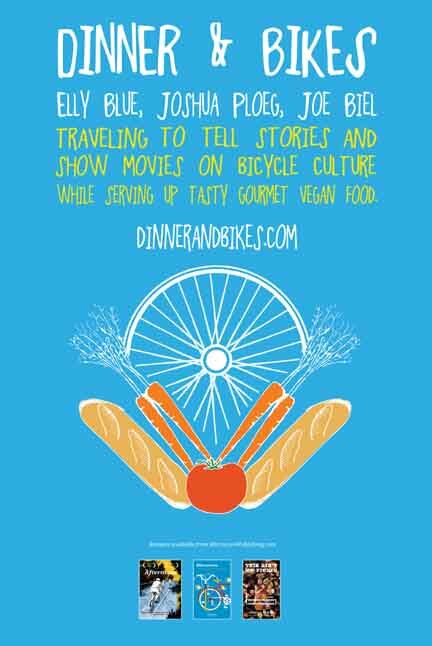 Our next full-on, month-long Dinner and Bikes Tour is coming up in April, 2013. We currently know for sure that we’re going to Michigan and New York State. And Chicago. And that general region. Look us up if you’re interested in hosting an event in your town! In the meantime, we are having a mini-reunion tour in southern California. We’ll be doing it up proper with amazing food, new movies, and new ideas in San Diego this Friday, Sept 7th, and in Santa Monica on the 14th. Details on our events page…. This last tour was, by all forms of accounting, our best one ever. Every show ruled. Every person at every event was awesome. Every city was doing heartening things for bikes. Even the car catching on fire early in the tour couldn’t stop the chain of excellent events. Some of the feedback we’ve gotten over email since the event has been really touching. The kind of stuff that makes me think, “THIS is why we drop everything and leave our home and friends and bikes and cat behind to sit in a cramped car for weeks on end without always knowing we’ll have a place to sleep that night.” Here’s a sampling of the best. Since you’ve gone, not a day has gone by that we haven’t ridden our bikes everywhere we’ve gone and even embraced taking the lane a few times (in admittedly low traffic). This afternoon we’re headed to Fairhope to see how their newly restriped areas of town are doing and so we can write their mayor and city council to thank them for it and let them know it brought us to their town to spend some money. Anyway, all that to say that we’ve taken on even more of a role as bike advocates here in town, thanks in large part to your visit, and we’d love to stay in touch. I just read your entry on my hometown of Baton Rouge and am amazed that anyone can bike in that city, though I did notice the prevalence of sharrows in my sister’s area of town starting a few visits ago… I would be terrified to try them out with all of the surrounding aggressive drivers, in all honesty, but each time I go I’ve noticed more and more cyclists and it seems a lot less intimidating. I’ll post more love notes as we get them! Comments Comments Off on Sweet words of love! Well, we’re doing it again. Last September, we brought our fancy food and bike talk and movies all around the western U.S. This April and May we’ll be driving a big loop around the South, serving scrumptious food, talking about big ideas in bicycling, and learning about food and bike culture everywhere along the way. Right now our calendar is wide open still has some gaps! with mostly flexible dates, stops, and routes. Get in touch if you want to talk about putting on an event in your town.